Until now, we’ve relied on our keywords to guide us toward offices that buy our stuff. However, now that we’ve identified the anchor customers, we need to actually get into the contracts to make sure the keywords got us to the right place. 1) It is the ultimate validation that this office is buying something that we can provide. 2) Reading RFPs is one of the best ways to learn about our soon-to-be customer and their needs. 3) We’ll disassemble contracts in a way that helps build a valuable library of content that we can deploy when we write our first proposal. Step 1: Go to worksheets and download the”Customer Insights” worksheet and open the RFPs tab. 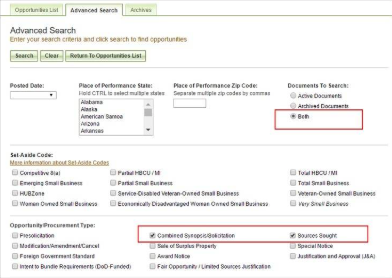 Step 4: Under “Agency/Office/Location” select“Specific Agency/Office/Locations” and type the beginning of the office into the search bar. Select the office you are interested in. *Tip: You may not be able to find the name of the office that you identified as your anchor customer. This is because FBO and USASpending use different name conventions and organize the government differently. While it’s very annoying, there unfortunately isn’t a better way to do this. So if you can’t find your office, search for your sub-agency. 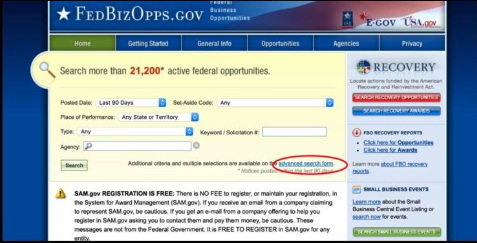 Then if you can’t find that, search for your agency, which will definitely be there. Step 5: Go to the “Keywords” section and enter one or two keywords that relate to the product or service you are considering selling to this anchor customer. Step 6: Under “Classification,” choose the amount you are principally interested in selling of the product, and the letters you are planning to sell services to. As we discussed in the resources class, what you get from this search is not going to align with USASpending. 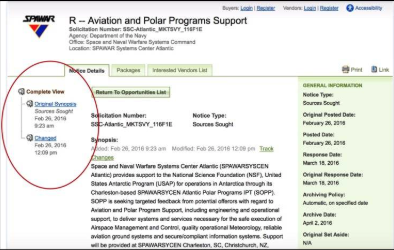 USASpending provides historical data and FBO provides data on currently available RFPs. So while they overlap at times, more often they do not. But that’s ok. At this point, we aren’t looking for individual opportunities to go after, we just want to see exactly how the government is buying our stuff. This search will return a list of contracts that should be in our area of interest that are currently or were recently competed. Start scanning through the list and get a sense for whether or not they are really a type you’d be interested in. Then look at the PSC Code . If you find that certain PSC Codes are not returning contracts you’d actually be interested, select “Refine Search” at the top and remove that PSC Code from your list. 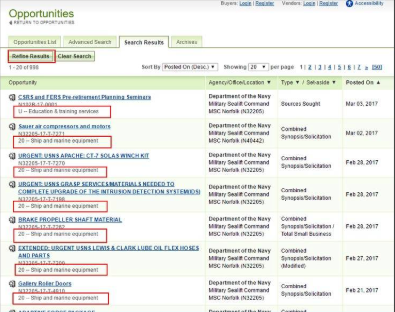 Step 8: Read the titles of the contracts in your search results and choose the first one that sounds promising. This will bring up the the solicitation page for that contract. On the left is the original solicitation and any amendments to it. Most of these amendments will be answers to questions that interested vendors have submitted so lets ignore them for now. In the middle there is a synopsis of the solicitation, so it’s a good idea to skim it to see if this contract really is in our area of interest. There may be some boiler plate at the top, but at some point it should address the substantive requirements of the contract. Use those to gauge how interesting it is to you. If you find one of these docs, open it up and scroll down to the section that details out all the work the government is asking for in this RFP. The work is generally chunked into major topics with more discrete requirements below. You may have to search a bit for this information, and you may have to open folders or check a couple of different documents to find it. But keep poking around. If you still can’t find any documents, or the right documents, then go back to the original synopsis and see how much information they share about the contract requirements there. If you can find some information on the requirements, then go on to the next step. Otherwise, go back to your list of RFPs and choose the next promising one. 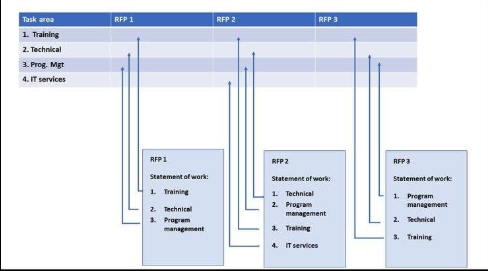 Step 9: Then start copying the text of each requirement into the worksheet organized in the same way that the RFP organizes it. As you see a hierarchy in the work, (like a cluster of requirements around a major task with a half dozen more specific tasks under it), mirror that structure in your worksheet. Then, open up the PWS of the next contract and start entering the text of the requirements into the next column, as seen as above. You may find that some contracts have requirements areas that other contracts do not at all, in that case there may be some blank cells in the worksheet, that’s ok, don’t force it. Admin requirements: Include administrative requirements that you find in the contract, things like insurance requirements, or the number of people who have to have a certain certification.